Blindness can come from many different causes. It can be as a result of an eye disease, genetics, or injury. 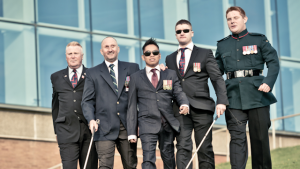 There are many veterans in the UK that have become blind since their service. To assist them there are several clubs and societies that have been formed. They have become extremely important to the blind veterans and those with low vision. It allows them to socialise and makes them realise that they are not alone. For those who are new to blindness, they often believe they have lost everything. That they will no longer be able to participate in activities they once enjoyed. Such as shooting or archery. This is not the case. There are clubs for both of these activities specifically for those with sight loss. For shooting there is the Acoustic Rifle Shooting Club. Special equipment is used. Rifles have light sensors built into them. As the aim gets closer to the centre of the target a pitch sound changes as an indicator. The Archery Club uses special equipment and a spotter for these events. The club is not just a small group that gets together once in a while. Participants compete throughout the country in events. The term Goal here means “get out and live.” That is exactly what its participants do. It is for those who have sight loss and are between the ages of fifty to seventy-six. Participants go out in groups and enjoy all types of activities. One of their events is to go and visit places that they are all interested in. Also, they will participate in different activities. Veterans are known to be active. When stricken with blindness it makes it difficult for them to realize that they can go beyond the limits they may set for themselves. There is a Ski Club where blind veterans team up with Armed Forces Ski Guides.